Know someone who considers themself a bit of an epicure? A chocolate gourmet? Or simply just can’t enough chocolate? Well we’ve created the perfect club for them. 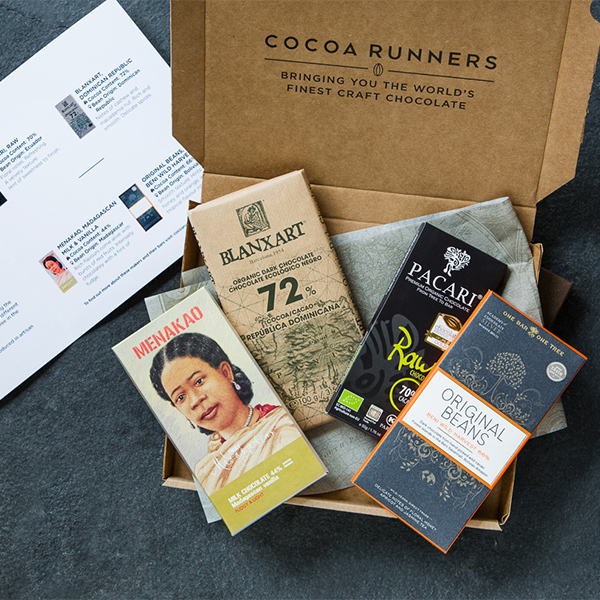 As a member of the Cocoa Runners club they’ll receive a box of four carefully selected premium chocolate bars every month in their choice of either mixed or dark bars. With each box we aim to broaden their experiences of chocolate, from exploring single origin beans, to comparing styles and flavour from different parts of the world, to unwrapping the stories behind our artisan makers – they’ll have plenty to look forward to. They’ll also find tasting cards and expert reviews by our team to guide them along the way. What’s more exciting than receiving the finest chocolate from around the world straight to your doorstep?! This is a digital gift voucher. Your digital gift voucher will be sent to the email address you specify above automatically. It is a PDF voucher that you can either send direct to the recipient (if you know their email address), sent to yourself to later forward them, or print out at home to give to them in person. If you have not received an email from us within 2 hours of purchase please email us at team@cocoarunners.com. 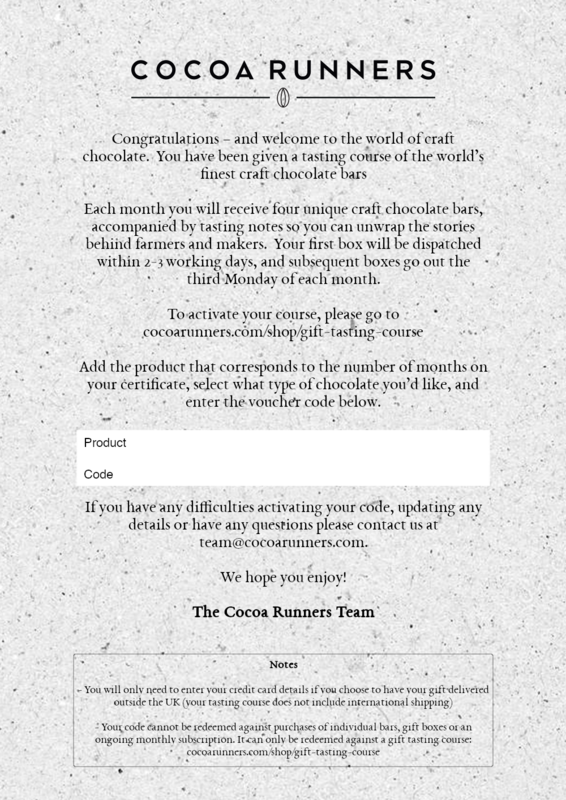 Please note, this email address is only monitored Mon-Fri.
(You can buy a gift tasting course and get it delivered direct to them by clicking here).